Even those well-versed in chess history may not be that familiar with the Chicago 1926 Masters’ Tournament. 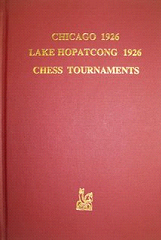 According to the introduction the event was only “lightly reported” in the chess press and was overshadowed by the Lake Hopatcong tournament. Jeremy Silman pointed out that his “database of over 3,850,000 games only has 27 from the Chicago 1926 event, while the tournament book ... has 78!” The game scores (a dozen or so incomplete) were recovered from Photostats of the original score sheets. Chicago was won by Frank Marshall with 8½, ahead of Maroczy and Torre at 8, and Jaffe and Kupchik on 7½. The remainder of the field was Kashdan, Factor, Ed. Lasker, Fink, Banks, Chajes, Showalter, and Isaacs. As the author notes, Chicago “was something of a watershed” for Marshall; aside from Olympiads, “he never again won a significant tournament.” Lake Hopatcong 1926 was a five-player double round-robin event with Capablanca winning ahead of Kupchik, Maroczy, Marshall and Ed. Lasker. Sherwood provides detailed notes to all the games and the diagrams are plentiful. This is a limited edition of 600 numbered copies, so it is sure to be a collector’s item. Get one while you have the chance. Send your payment to Dale A. Brandreth, Caissa Editions, P.O. Box 151, Yorklyn, DE 19736.